Carbon dioxide helps plants grow — it is not something that we should regulate as a toxic pollutant. We don't need the Supreme Court to tell us carbon dioxide is a pollutant -- we just have to look at our changing world. We commonly think of pollutants as contaminants that make the environment dirty or impure. A vivid example is sulfur dioxide, a byproduct of industrial activity. High levels of sulfur dioxide cause breathing problems. Too much causes acid rain. Sulfur dioxide has a direct negative effect on our health and the environment. On the other hand, plants need CO2 to survive. The CO2 greenhouse effect keeps our climate from freezing over. How can CO2 be considered a pollutant? Over most of the past 10,000 years, the level of atmospheric carbon dioxide in the atmosphere has remained at relatively stable levels. However, human CO2 emissions over the past few centuries have upset this balance. The increase in CO2 has some direct effects on the environment. For example, as the oceans absorb CO2 from the atmosphere, it leads to acidification that affects many marine ecosystems. However, the chief impact from rising CO2 is warmer temperatures. 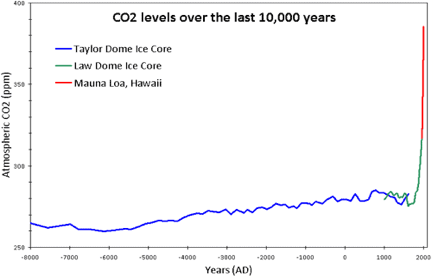 Figure 1: CO2 levels (parts per million) over the past 10,000 years. Blue line from Taylor Dome ice cores (NOAA). Green line from Law Dome ice core (CDIAC). Red line from direct measurements at Mauna Loa, Hawaii (NOAA). © John Cook. Rising CO2 levels are causing an enhanced greenhouse effect. This leads to warmer temperatures, which has many consequences. Some effects are beneficial, such as improved agriculture at high latitudes and increased vegetation growth in some circumstances. However, the negatives far outweigh the positives. Coast-bound communities are threatened by rising sea levels. Melting glaciers threaten the water supplies of hundreds of millions. To focus on a few positive effects of carbon dioxide is to ignore the broader picture of its full impacts. The net result from increasing CO2 is severe negative impacts on our environment and the living conditions for people.